As a former New England Patriot and a current member of the team’s strength and conditioning staff, I’ve always had more than enough reasons to root for the home team. This season, though, I’ve had even more cause to celebrate every Patriot touchdown. 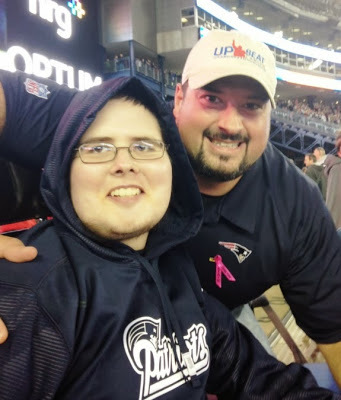 In August, the Joe Andruzzi Foundation partnered with National Grid, CBS Radio, 98.5 The Sports Hub Patriots Radio Network and The Place restaurant to support local cancer patients and their families through our Points for Patients program. The rules are simple, but the impact is crucial – for every touchdown the Patriots score this season, National Grid will donate $500 to our Foundation, AND will also match public contributions, up to $75,000. Click here to make a donation. So far, New England has scored 26 touchdowns through ten games, which means we have raised a total of $13,000 for patient families through touchdown-donations alone. These generous donations provide much needed financial relief to cancer patients and their families so they can focus on what really matters – getting better. National Grid is also creating once-in-a-lifetime (Up)Beat game day experiences for our patients: the program – in partnership with 98.5 The Sports Hub and CBS Radio Boston – hosts patients and their families at each Patriot home game. For one day, at least, patients can be free of the stress and struggle that comes with a cancer diagnosis and treatment, and focus on nothing but fun. For our Foundation, nothing can top putting a smile on a patients’ face. And because of National Grid’s generosity – as well as YOUR public donations – we are able to help a growing number of patients stay positive. You can add Devin Depauw to that list – a 16-year-old from Hanover Woods, who attended the October 13 game against the New Orleans Saints thanks to the Points for Patients campaign (you remember that game, don’t you?). Last spring, Devin’s mother Diana became concerned about his constant fatigue, dark circles under his eyes, and the appearance of spots on his chest and in his mouth. She initially worried that the spots were a symptom of Lyme disease, but on April 17, 2013 Devin’s blood work revealed that he has Lymphoblastic Leukemia. The Depauw family was sent into a tailspin when Devin, the oldest of four kids, was diagnosed. Devin’s road has not been an easy one – he’s spent months in and out of hospitals, undergoing intensive chemotherapy treatments – so our Foundation decided it was time for him to take a day off just to be a kid. 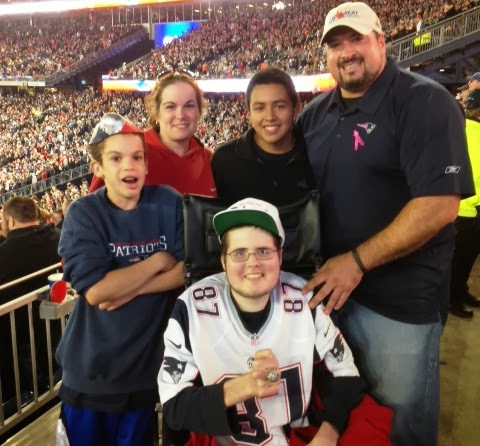 With two years of treatment left and very limited mobility, it’s not always easy for Devin to keep his spirits up, but they were running high during that Pats game. We were honored to give Devin and his mother even a few hours of carefree, cancer-free fun. “It was a light in our tunnel,” said Diana. I was lucky enough to join them to watch the last quarter of the game, and we celebrated together when Tom Brady found Kenbrell Thompkins in the back of the end zone on the last play to win the game. To help Devin in his fight, the whole family makes sure life feels as normal as possible. They cook together, go to the beach and visit the aquarium. When he’s not watching his favorite New England sports teams, Devin copes with his diagnosis by writing a book about his experience with Leukemia, and plans to have it published once he finishes with treatment. I’ll be first in line at the book signing. We were so thrilled to have Devin at the game and wish him well in his recovery. He is an amazingly upbeat kid, and the perfect example of how supporters are making a difference with those fighting this devastating disease. We’re so proud of the funds we’ve raised together to help patients like Devin so far this season with our Points for Patients campaign, and can’t wait to root for more Patriot-touchdown’s down the stretch. To make a donation of your own towards patient families like the Depauw’s, visit the Joe Andruzzi Foundation website – National Grid will be there all season long to match it.